In small bowl, pour boiling water over dried cherries. Let stand 15 minutes or until cherries are plump. Drain. 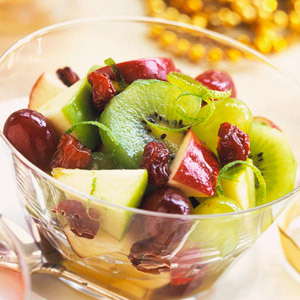 Meanwhile, in a large bowl, combine green and red grapes, Granny Smith and Red Delicious apples, and kiwi. Add drained cherries. In a small bowl, combine honey, lime peel, and juice. Pour honey mixture over fruit and toss to coat. Chill up to 2 hours before serving. Spoon into serving dishes. Makes 8 to 10 side-dish servings.